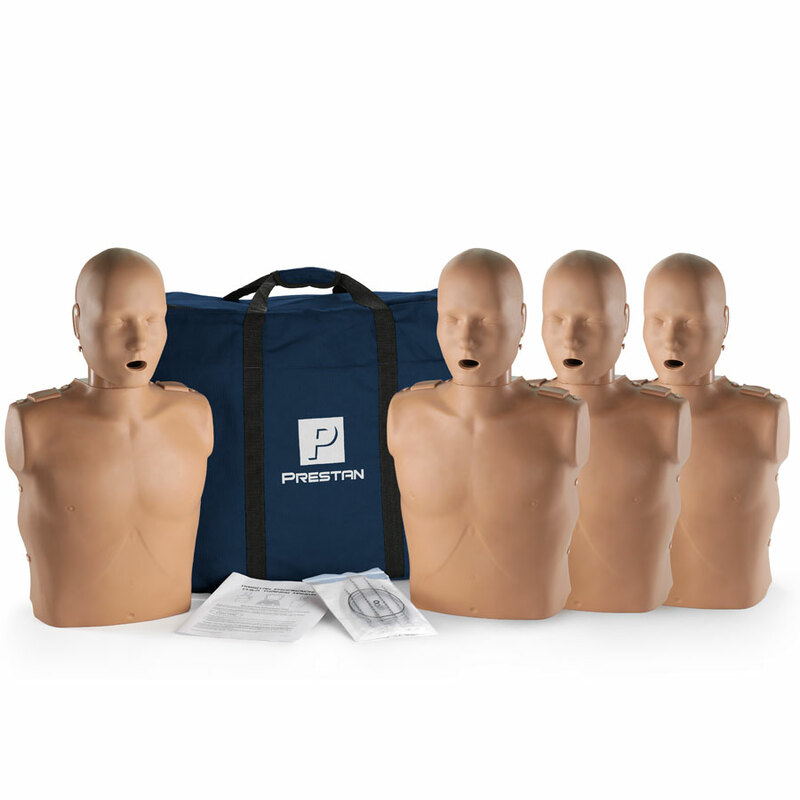 Prestan Adult CPR Manikins & Supplies | CPR Manikins - YOUR SOURCE FOR THE LOWEST ONLINE PRICING FOR ALL MAJOR BRAND CPR MANIKINS! 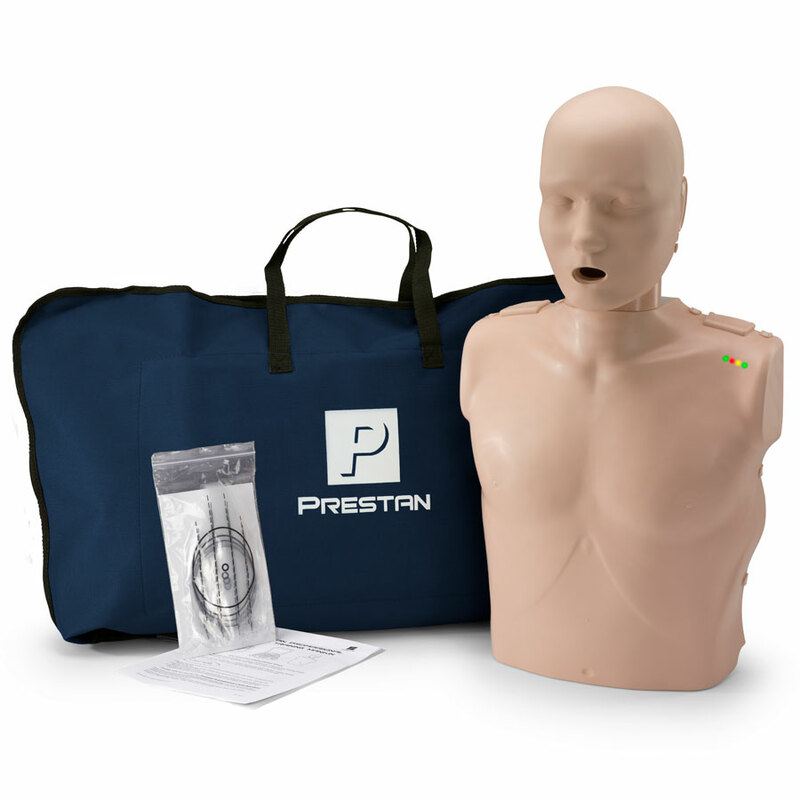 Prestan Professional Adult CPR Training Manikins are a must have. 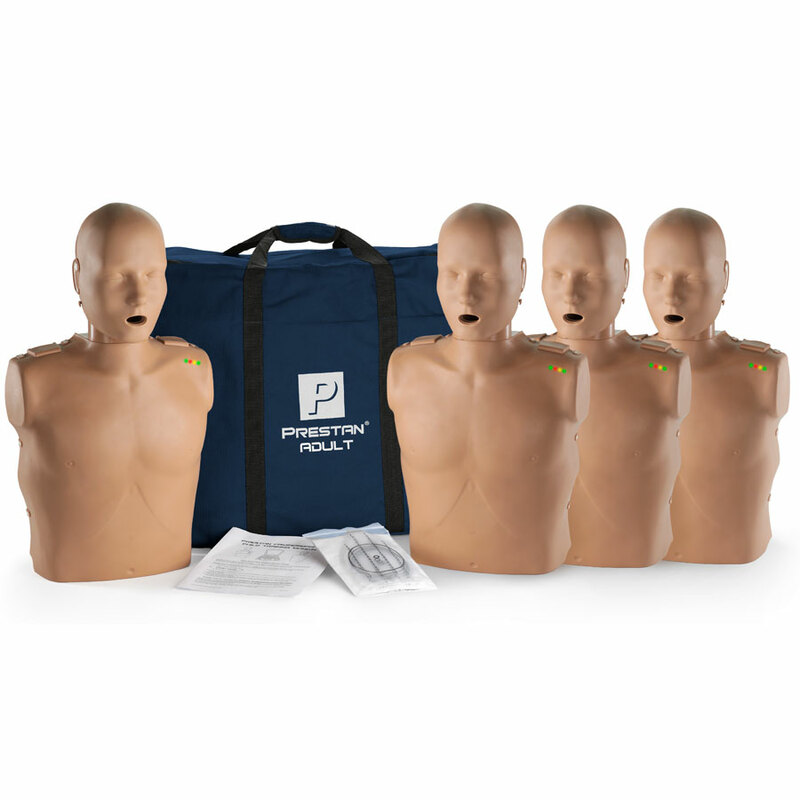 If you are looking for adult size CPR / AED training manikins you just found them. Instructor and student get feedback from the CPR Rate Monitor which provides details regarding the rate of compression. 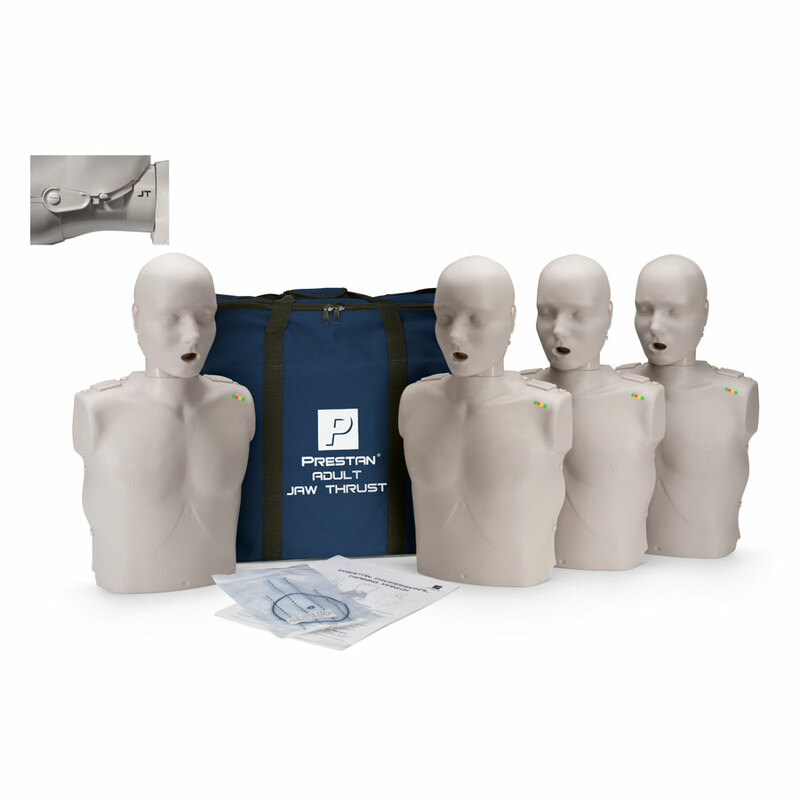 Also see the Prestan Family CPR Training Manikin Family Pack! Also see our Prestan Child CPR Manikin & Prestan Infant CPR & AED Manikin. Some distributors offer free bonus items or free shipping when ordering this item. 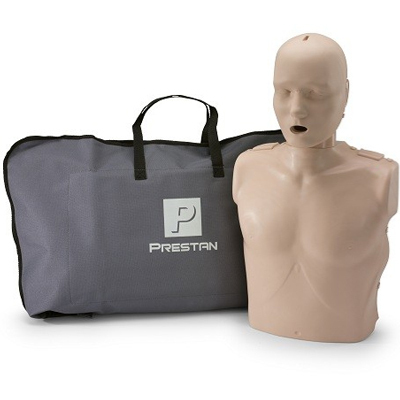 The Prestan Professional Manikin will accept a breath of 700-1000ml and deliver a chest rise. However, it will also deliver a visible chest rise for breath volumes of 500-600 ml based upon the changes in the 2005 guidelines. 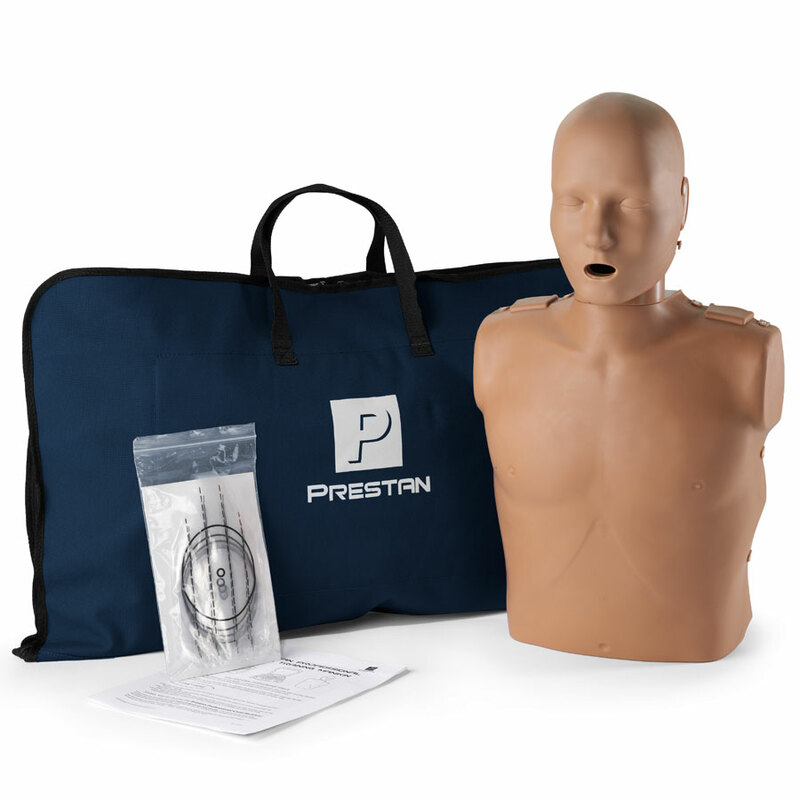 This manikin features a unique clamshell design that accommodates an easy-to-insert face shield lung bag, and Prestan's new CPR Rate Monitor that provides instant feedback to both students and instructors about the rate of chest compressions! 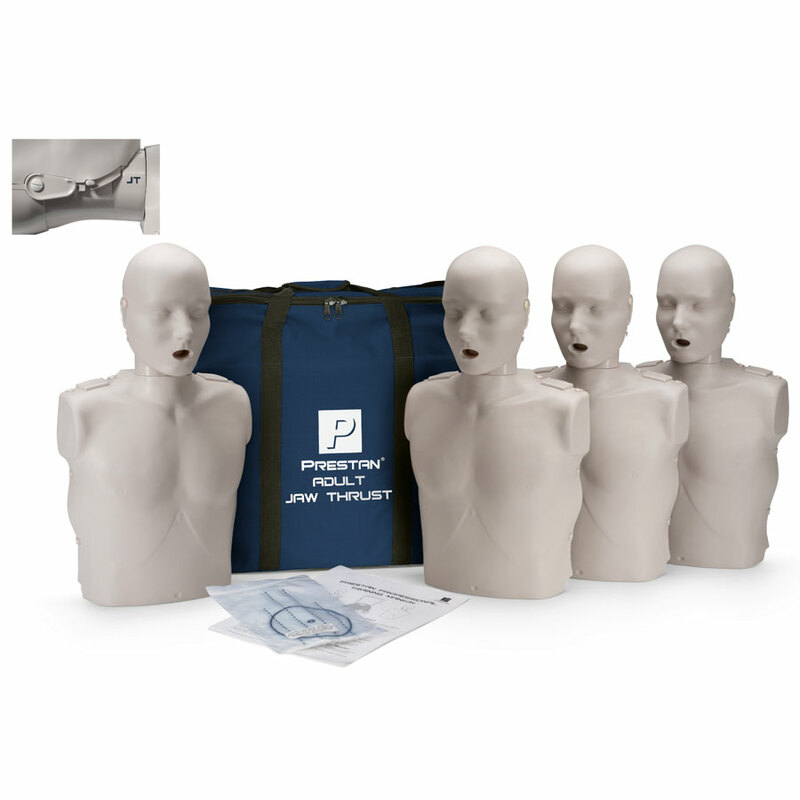 Other features include a patented face/head tilt that simulates the way an actual victim's head would move, and helps teach students how to open the airway during CPR; full chest rise; and a clicker mechanism that helps students learn to use the right amount of force in order to compress the victim's chest to the correct depth. 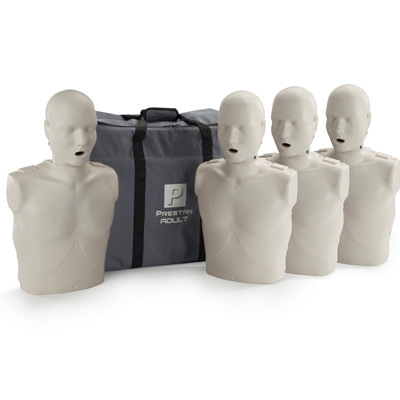 Portable and easy to set up at training sites, the manikin comes with 10 adult face shield lung bags, and a nylon carrying case. 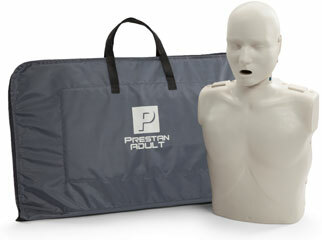 ~Includes 1 manikin with chest rise monitor, 10 face shield lung bags, and a nylon carrying bag. 3 year Manufacturer Warranty and 100% Toll Free, Friendly, & Informative Customer Service from Us! The combinaition of Prestan's revolutionary new CPR Rate Monitor with a 'depth' clicker allows for instant feedback to both instructor and student regarding the rate and depth of chest compression. This allows each student to gauge their rate and depth of compressions on their own as well as allowing the instructor to monitor several students quickly and easily. And with our realistic face/head tilt, the Prestan manikin simulates the way an actual victim's head would move if heor she required CPR. Special ""Skin"" designed to resist adhesive build up from AED electrodes! 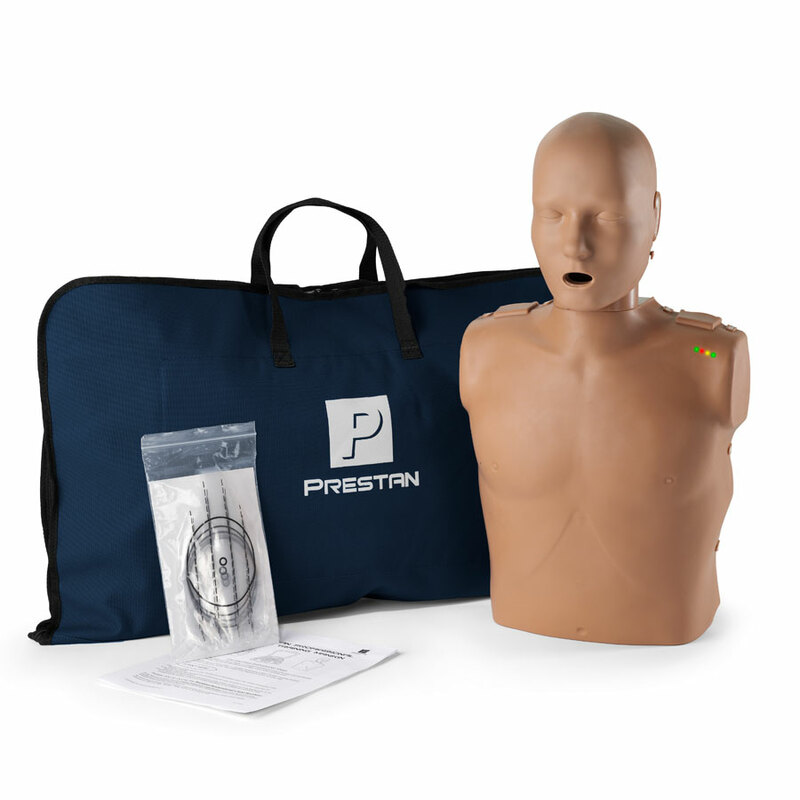 Prestan's optional CPR Rate Monitor (not included in this model), with visual cues that let students and instructors see when the correct compression rate has been reached and if it is being maintained *** Unique to this manikin, and amazing feature at this price! Unique clamshell design! Surprisingly inexpensive maintenance and low cost lung bags! 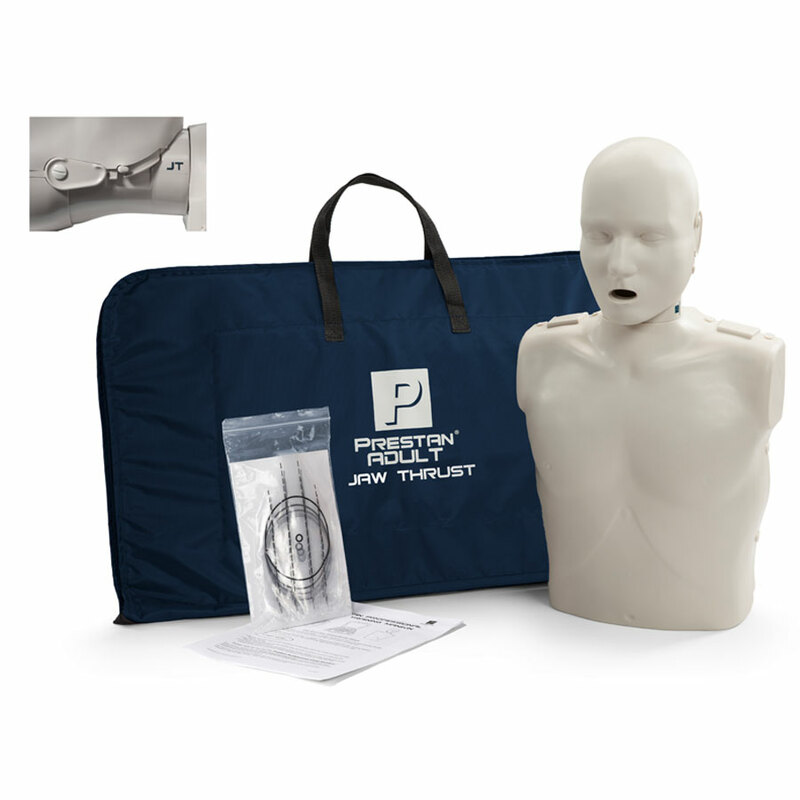 This manikin features a unique clamshell design that accommodates an easy-to-insert face shield lung bag. Other features include a patented face/head tilt that simulates the way an actual victim's head would move, and helps teach students how to open the airway during CPR; full chest rise; and a clicker mechanism that helps students learn to use the right amount of force in order to compress the victim's chest to the correct depth. 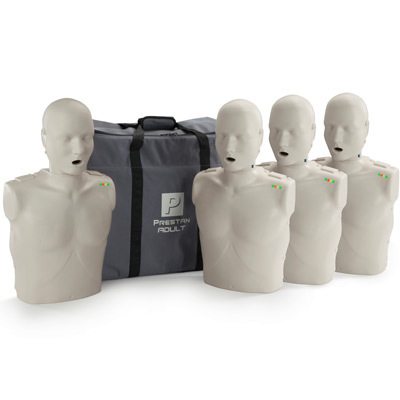 Portable and easy to set up at training sites, the manikin comes with 10 adult face shield lung bags, and a nylon carrying case. ~Includes 1 manikin, 10 face shield lung bags, and a nylon carrying bag. 3 year Manufacturer Warranty and 100% Toll Free, Friendly, & Informative Customer Service from Us! 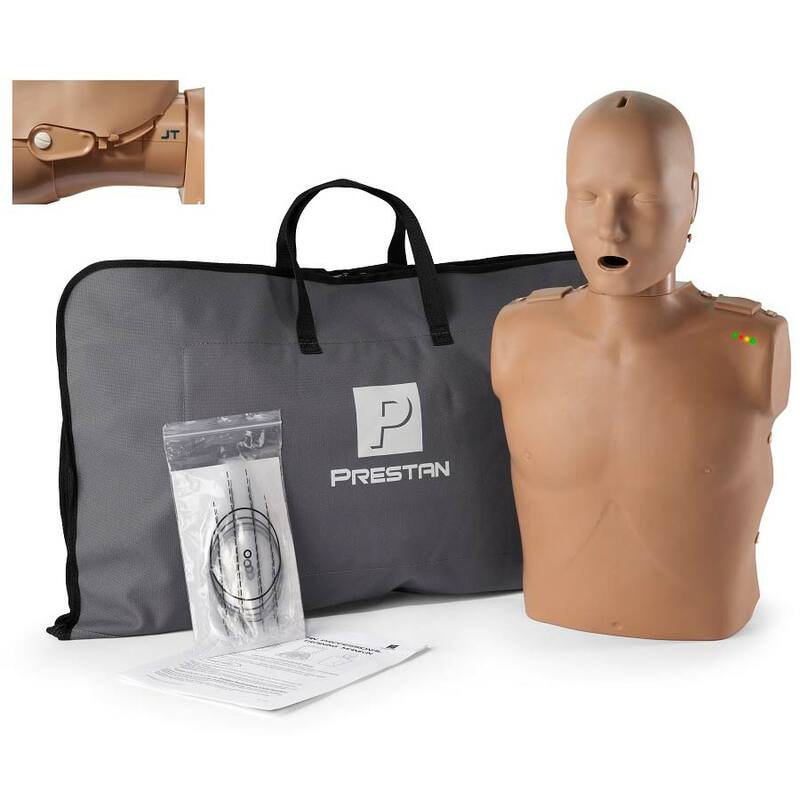 The Amazingly affordable Prestan Mankin is Available individually or in convenient multi-packs of four for class training purposes, this manikin is uniquely designed as a clamshell that accommodates an easy-to-insert face shield lung bag. Unique clamshell design! Convenient 4 pack... Surprisingly inexpensive maintenance and low cost lung bags! The manikins in this pack feature a unique clamshell design that accommodates an easy-to-insert face shield lung bag. 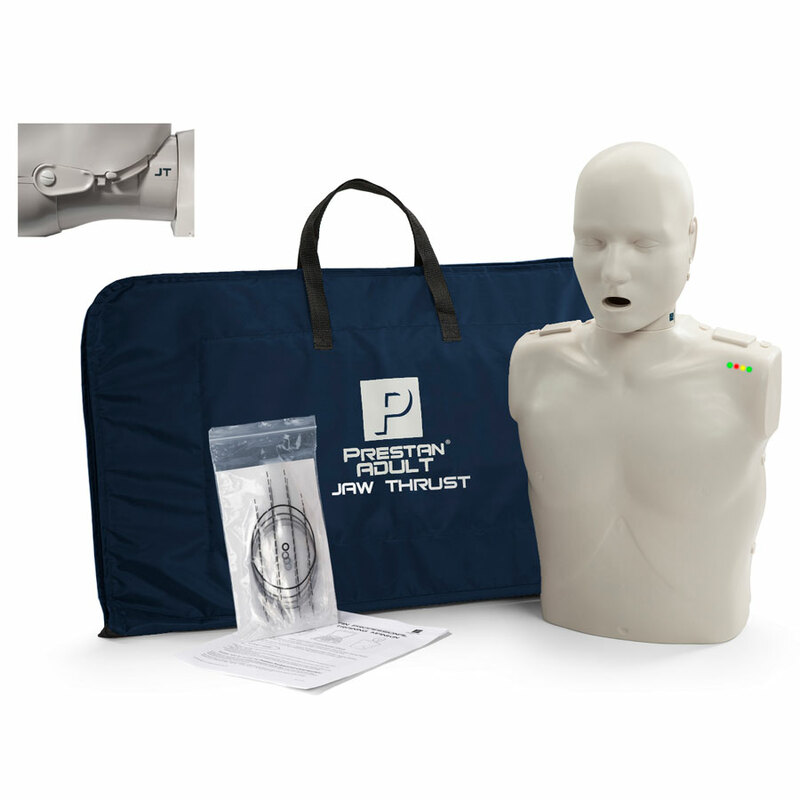 Other features include a patented face/head tilt that simulates the way an actual victim's head would move, and helps teach students how to open the airway during CPR; full chest rise; and a clicker mechanism that helps students learn to use the right amount of force in order to compress the victim's chest to the correct depth. Comes with 4 manikins, 50 adult face shield lung bags, and a nylon carrying case. 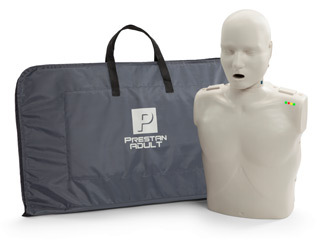 ~Includes 4 manikins, 50 face shield lung bags, and a nylon carrying bag. 3 year Manufacturer Warranty and 100% Toll Free, Friendly, & Informative Customer Service from Us! 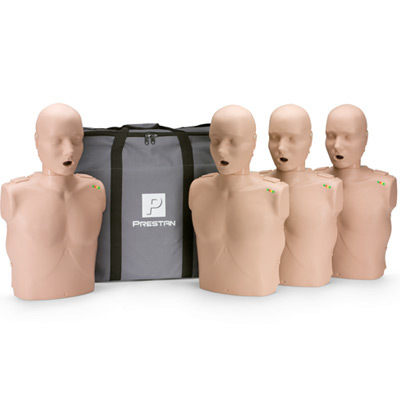 Features 4 Prestan manikins with the unique clamshell design that accommodates an easy-to-insert face shield lung bag, and the new CPR Rate Monitor that provides instant feedback to both students and instructors about the rate of chest compressions! 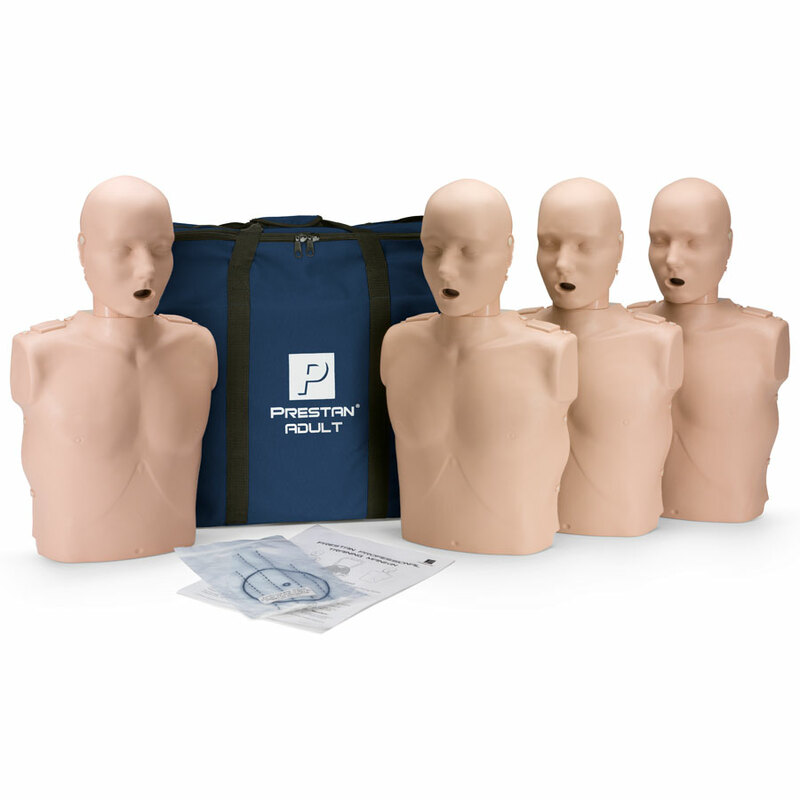 Each manikin also features a patented face/head tilt that simulates the way an actual victim's head would move, for realistic practice in opening the airway during CPR; full chest rise; and a clicker mechanism that helps students learn to use the right amount of force in order to compress the victim's chest to the correct depth. 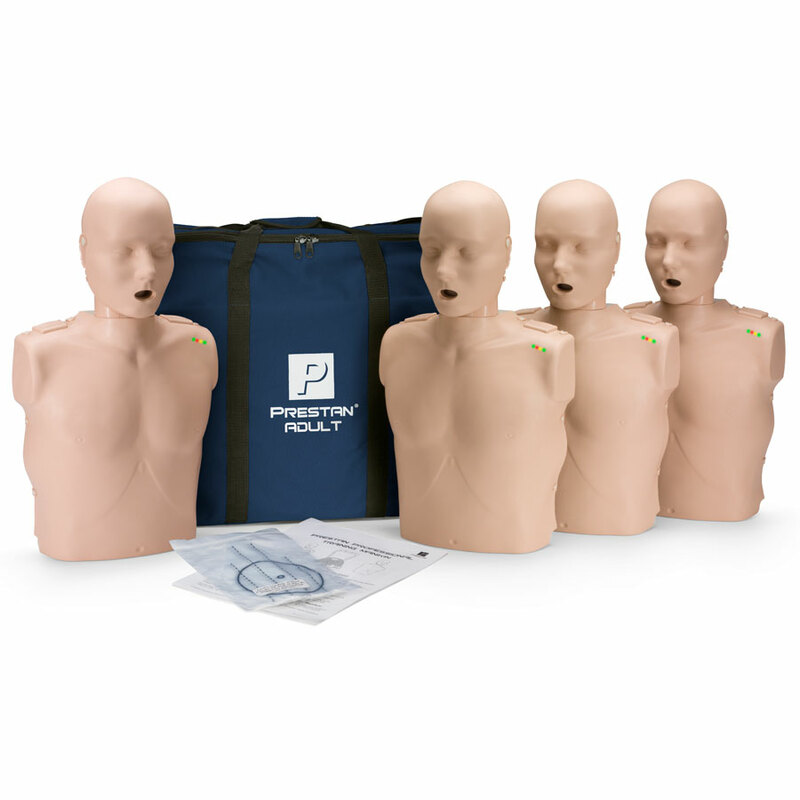 Portable and easy to set up at training sites, the pack comes with 4 manikins, 50 adult face shield lung bags, and a nylon carrying case. ~Includes 4 manikin, 50 face shield lung bags, and a nylon carrying bag. 3 year Manufacturer Warranty and 100% Toll Free, Friendly, & Informative Customer Service from Us!